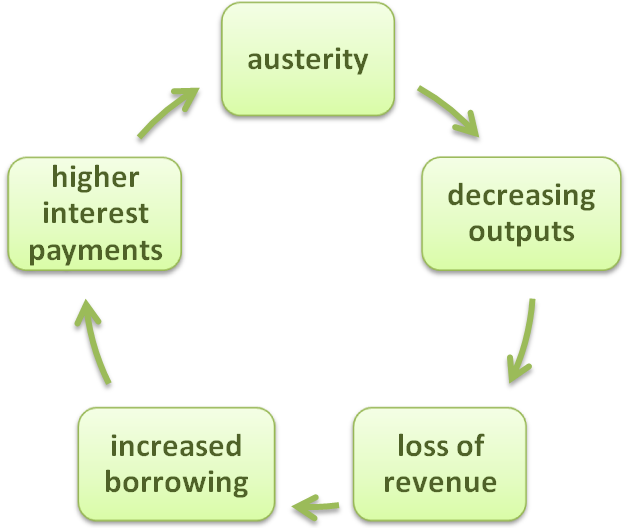 There's a very nice little blog on an IMF report from 2011 on the Touchstone website. And it illustrates a good point about where we get our information from and to what extent we can trust the government and the media to keep us well informed. Back in Oct 2011 the IMF were saying that if growth slows that austerity cuts would need to slow down. The said the same thing in their most recent report: the BBC reported it like this: "The government should slow the pace of budget cuts next year if UK growth does not recover, the International Monetary Fund (IMF) has said." So it seems the IMF is consistently telling the government to on cut public spending if there is sufficient growth. This is the lesson that Japan learned the hard way in the 1990s. The government on the other hand take the IMF report as a confirmation that austerity is the right thing to do. Back to Oct 2011 there is another story in the IMF report which was not picked up on by the media and flatly contradicted by the government. And it relates to a graph. All credit to Duncan Weldon for spotting this and telling us what it means. As the title says this graphs shows us what caused public debt increases post 2007 when the credit crunch hit - 5 years ago this week. All the figures are as a percentage of GDP. I won't talk about Italy because Italy is clearly in a class of it's own. The red block is fiscal stimulus and the graph shows that compared to France and Germany the UK spend less on fiscal stimulus. Note that Germany spent much more on fiscal stimulus and now has a much healthier economy than most of the rest of Europe. These two facts are intimately connected. The yellow line is amount spent supporting the financial sector, and here again Germany spend a great deal more. The grey line is basically interest payments which went up either because of more debt or higher interest rates, or both in Italy's case. Clearly this is the primary driver for Italy. Finally the blue line is revenue loss attributable to the economic downturn - the loss of production. Note that Germany which proportionally spent a great deal more bailing it's economy out, now has a negative contribution from loss of production - i.e. they gained revenue over this period. 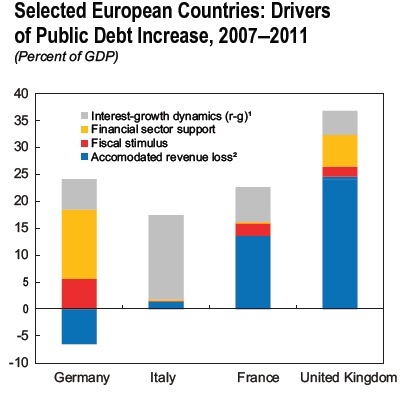 In France and Germany revenue loss was the major driver of borrowing.